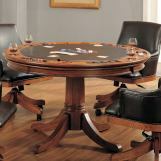 Add traditional charm to your game room with Hillsdale Furniture’s Parkview game room collection. 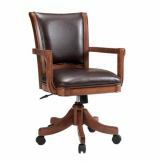 Finished in a medium brown oak with deep brown leather seat cushions, this set combines comfort with casual living and functionality. 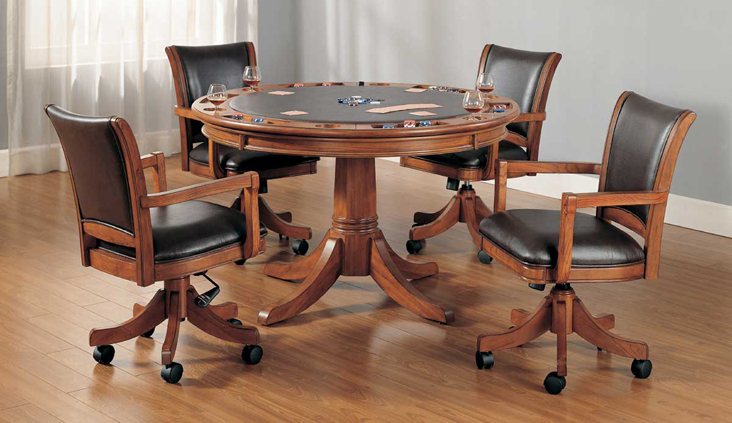 With a classic pedestal base and a clean rectangle chair back chair with arms, this multi function table offers a dining surface on one side, a leather topped game surface on the other, as well as storage and checker and backgammon game surfaces underneath the top. Composed of solid woods, climate controlled wood composites, and veneers, this ensemble can find a home in your game room, den, or kitchen. 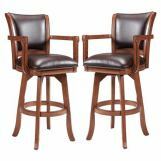 Complete your game room décor with the matching bistro table and barstools.